Standard on all trims of the Jeep Cherokee is the ParkView, a rearview camera that displays a video image on your dashboard screen when you shift into reverse. The image includes dynamic gridlines to guide your direction. Depending on which trim you go with, you can get the ParkSense Rear Park Assist with Stop system, which consists of four sensors located in the Jeep Cherokee’s rear fascia. 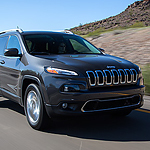 These sensors will alert you if your Jeep Cherokee gets too close to an object or another vehicle. Both the ParkView and ParkSense systems are useful for ensuring that you avoid unnecessary accidents.